Ok, so here we go. Grattamacco. I'm starting with the simple. This is just a pamphlet. Not a brochure, not pretty pictures, this is just one piece of paper. Real simple, but I read it as I met with the owner Claudio Tipa at the resent Tre Bicchieri. Yes a three glass winner, and a number of times. And this wine is one of the most outstanding Super Tuscans of them all. I've never been that much into it. Yes knowing about so many Italian Wines, working with them, tasting, drinking, selling, this that and every other thing for years. There is not one person who knows it all, and I know more than most. But I do not know everything. So I delve into this one. A good friend of mine who is a true Italian Wine Afficianado absolutely adors this wine, and is always talking about it. His name is Pat and he is absolutely spot on in his Love and enthusiasm for this wine Grattamacco. Taking a sip of the Grattamacco that Claudio poured for me, I liked it instantly. And as he spoke of the wine and how it is made, he perked my interest even more. Grattamacco and its estate is Organic. And the way that it is made by Claudio's wine-maker Maurizio Castelli, is truly amazing. The wine is made in small French Oak Barrels by hand. The grapes are pressed and the must (juice) is put into the small barrels with the skins and punched down by hand. Amazing. Anyway, all this Claudio told me at the table, hey what info did I get from the pamphlet. Another Great wine at the tasting was the Renato Ratti Barolo Rocche 2006. Phenomenal and one of my Top3 Favorites of the day. Well some info that I got from the Ratti brochure was that the estate was founded in 1965 with the purchase of a small plot of land in the "Historical" Marcenasco zone, close to the Abbey of Annunziata. Third item on my list is the beautiful brochure of "Donnafugata" from my good friends Jose and Antonio Rallo. The Rallo Family is a lovely family who goes First Class all the way, from their vineyards to the winery's, the vines, the fruit, the wine-making, to the packing of beautiful bottles of wine with great labels, and yes right down to a First Class Brochure as well. Yes, the Rallo's are and go First Class from beginning to end. The first thing i found out by reading the brochure and not just merely looking through it is that the word Donnafugata means "Woman in Flight." Nice. Ok, now down to the wines. First I have to talk about the Donnafugata benchmark premier wine, Donnafugata "Mille Una Notte," or 1001 Nights. Mille una Notte, is a wine I've loved for years made of about 95% Nero d'Avola, Sicily's premier Red Grape and 5% other varieties which may include Cabernet Sauvignon and Nerello Mascallese. This wine is what I like to call "A BIG BAD BOY," meaning it is big and full bodied with tons of ripe fruit flavors, what they would call in California, a "Fruit Bomb," but a restrained fruit bomb, big and bold, but not overly concentrated, but just right. 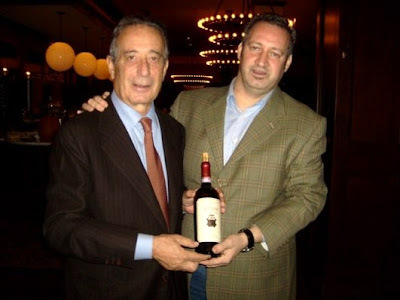 The "Mille Una Notte" is amongst Sicily's Most Famous wines along with the two most famous in the renowned "Rosso del Conti" from Giuseppe Tasca and "Duca Enrico," with the Cerausolo di Vittoria Planeta. In the brochure, it states that the "Ben Rye" is made of Zibbio grapes. That I knew. What I didn't know is that not all the grapes are dried as i had previously thought. First, there is a harvest of "Zibibbo" grapes that takes place within the last 2 weeks of August. These grapes are put on grapes to dry in the Sun for 3-4 weeks. OK, I knew that, but I had thought all the grapes were dried before I read the brochure. In September a second harvest takes place. The Zibibbo grapes are pressed and the must (grape juice) is placed in a vat with the to ferment with the dried grapes for about a month and a half till November. The result is something I know not from the brochure but from the numerous times I pleasured in the drinking of this "Nectar of the Gods," Ben Rye. The wine is lush with aromas and tastes of Honeysuckle, Peach, and Ripe Apricots. Drinking it, borders on Orgasmic. What else can I say. It's rare and wonderful pleasure, but obtainable, none the less. Treat yourself some day. Treat some friends. i highly recommend it.